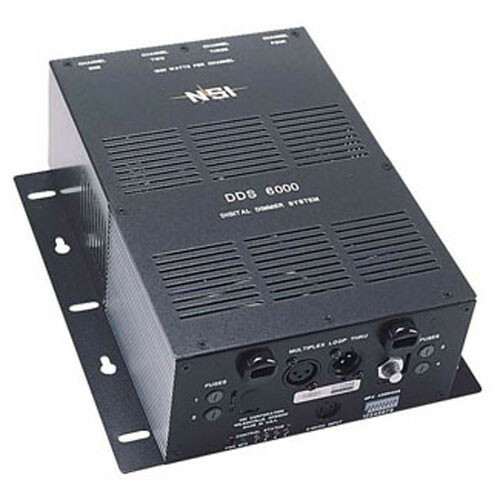 NSI N6000 Series Digital Dimming Systems combine portability with rugged construction for a variety of applications. DDS series dimmers may be assigned by channel to act as dimmers or as a relay switch for on/off operation of lights or motorized devices. The DDS6000 has four channels and a grounded Edison 120VAC 20 Amp mains power cable. Plug in single or ganged lights, up to 1200 watts on each channel, up to 2400 Watts total on this model. Its circuit breakers are external on the front panel. Also equipped for NSI 128 channel Micro-Plex (3-Pin XLR) operation. Four channels, 1200 watts per channel maximum, not to exceed 1800 watts output for entire unit. Toroidal filtering reduces audio interference and extends lamp life. User-select of soft-start operation also increases lamp life. Box Dimensions (LxWxH) 13.2 x 11.4 x 9.2"